Will Your Teeth Become Victims of Diseased Gums? Periodontal disease is the leading cause of early tooth loss in adults. Because the first stage, called gingivitis, is often painless, you may not even realize you have it. Commonly known as gum disease, the condition develops when bacteria-laden plaque forms on teeth and is allowed to remain. As infection and inflammation progress to periodontal disease, gums recede and pockets of infection form around the gum line. Eventually, connective tissue and surrounding bone structure are destroyed. At this stage, you may lose your teeth. Your oral health may even affect other parts of your body. 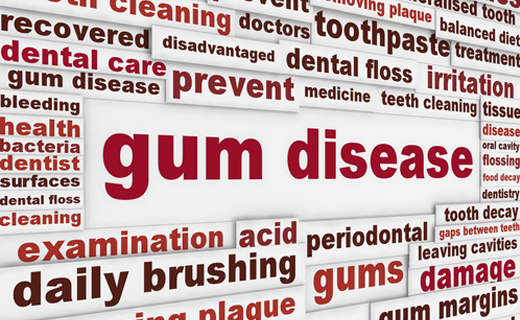 Researchers have recently identified possible links between poor gum health and medical problems like heart disease, low birth weight, and diabetes. Gum disease can occur without any warning signs, which is why scheduling routine dental check-ups is so important. Treatment options depend on the type of gum disease and how advanced it has become. Keeping your teeth healthy and clean with twice-daily brushing, daily flossing, healthy eating habits, and professional dental care will prevent periodontal problems from causing early tooth loss. If you have symptoms that suggest gum inflammation or infection, see your dentist as soon as possible. Early treatment of gum disease delivers the best results.